Golf is nothing short of an excuse for the well-to-do to idly walk around under the pretense that they are in fact doing something constructive in taking part in a “sport.” Nice though it may be that followers of the sport do their part to uphold the local economies of certain areas of Scotland and Kent, there is such little value in knocking a small ball about with much larger clubs in a competitive setting – it just makes no sense at all to me how seriously people take it, given that a single stroke can result in the necessity of a 200-plus yard walk along the line of the path of the ball. Merely walking gives a freedom unconstrained by such petty concerns as the flight route of a small white ball: something I would see as far more rewarding. All of this said though, there is something incredibly compelling about the experience offered by Everybody’s Golf. 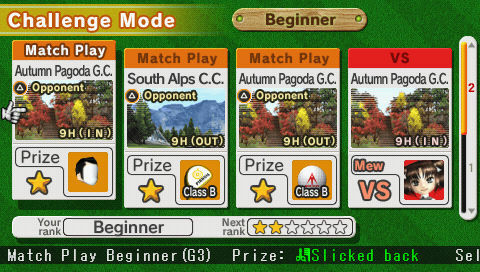 Even the menu screens in Everybody’s Golf are packed with colourful charm. Everybody’s Golf does a wonderful thing for golf in that it abstracts away the details of the sport itself in favour of making a video game out of it: while selecting types of club and types of balls still features in the game, its importance is not one of concern for presenting an accurate simulation to the player but rather as a method of providing rewards for success within the framework of the game’s Challenge Mode and allowing for customisation of each of the game’s ten available characters, allowing for players to adapt the abilities of their character to their own play style. 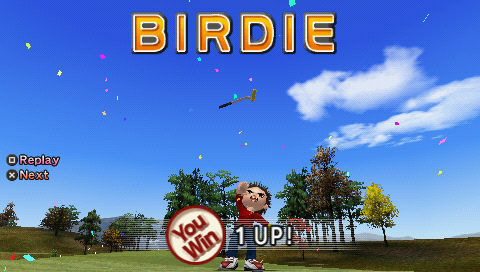 In making the in-game analogues to the real-world equipment essentially statistic modifiers, Everybody’s Golf does something nigh-on magical: it turns a sports game into a game that is, at its core, little more than a puzzle game with character development. It is about picking the right clubs and balls for the course that is being played on; it’s about knowing when hitting the ball as hard as you can is simply not the right option; it’s about knowing when a straight line just is not the best way from tee to hole. The game provides wonderful visual feedback for victory. If Everybody’s Golf is treated as a puzzle game, it’s one with a considerable amount of variety and depth. With six eighteen-hole courses (with very little in common) playable split between the front and back nine or the straight eighteen holes, either on one’s own or in competition with other human players or CPU players, every play session will be in some way different to the last, whether this be because of differing pressures on the player due to a differing play style on the part of competitors or the more simple, more honest forgetting of hole layouts. Wind conditions also vary from play session to play session, affecting the degree to which the ball will carry and in which direction it will be encouraged. These factors of difference between games create a surprisingly large number of possibilities for requirements of player thought in order to be successful. “Simple” is not quite the correct term to describe the gameplay given the number of factors that affect ball travel and the level of accuracy required to time a perfect swing of a club, but there is nothing here that is not intuitive, perfect for a portable game: while not too much mental engagement is required, the game does not fall into the trap of neglecting the engage the player to a significant extent. Everybody’s Golf is a triumphant embrace of the portable console on which it finds itself. Rainbows behind a ball in flight: real golf is obsolete. For once (perhaps twice, if Gitaroo Man is included), I find it difficult to find a negative comment to make about a game. It is a wonderful game for a handheld, with play sessions being limitable to a single hole or course if necessary but also extensible to multiple hours if that is what is desired. 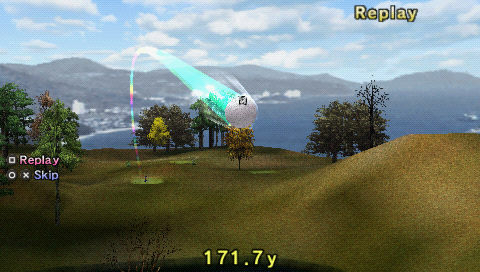 The gameplay is a simple timing exercise for making strokes, but far more strategic in the way that one should consider where they want to put the ball and the quick mathematics required to calculate the distance of the shot as a function of wind, swing strength and the nature of the surface your ball currently sits on. Everybody’s Golf is a delightful example of what more casual handheld experiences can and should be: delightful, engaging and compelling on the verge of addictive.